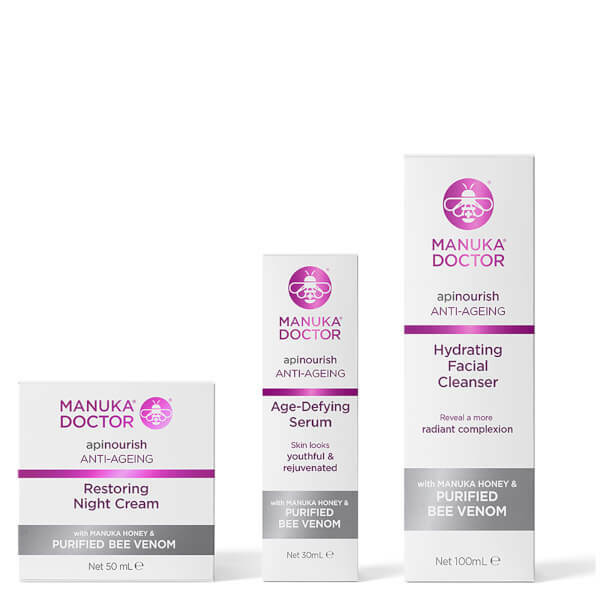 Treat your complexion to Manuka Doctor Daily Essentials; a skincare trio enriched with the highest performing ingredients from the hive. 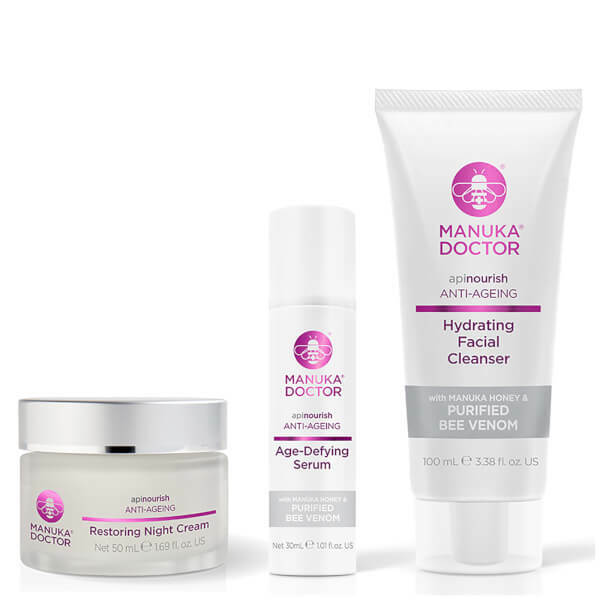 A must-have product for your anti-ageing skincare regime. Manuka Honey, Royal Jelly and Purified Bee Venom™ naturally improve suppleness and elasticity. Bursting with essential oils and nutritious vitamins, fine lines and wrinkles are softened and plumped, whilst Shea and Cocoa Butters add moisture. Super absorbent, skin feels firmer and looks gorgeously refined. A super-hydrating formula that helps to achieve smooth and younger-looking skin. Designed for tired, dull skin in need of a boost, the serum deeply penetrates with Purified Bee Venom™, Royal Jelly and Manuka Honey to seal in moisture and help improve elasticity. Bursting with essential oils and vitamins, the anti-ageing treatment works to smooth the appearance of fine lines and wrinkles and leave your complexion with a radiant healthy glow. An invigorating anti-ageing cleanser that deeply moisturises whilst it removes oil and impurities to leave you with brighter, more radiant-looking skin. The unique formula is infused with Manuka Honey, Royal Jelly and Purified Bee Venom™, which work in tandem to increase suppleness and elasticity. Botanical Green Tea Extract refreshes and revives, whilst Vitamin E provides antioxidant properties. Night Cream: Apply to clean skin every night. If signs of irritation occur discontinue use immediately. Serum: For best results, apply serum after cleansing and leave to be absorbed before applying your day or night cream. Cleanser: Massage onto dry face, neck and décolletage. Rinse off with warm water and a moist cloth. If irritation occurs discontinue use immediately. Night Cream: Aqua (Water), Caprylic/Capric Triglyceride, Butyrospermum Parkii (Shea) Butter, Cetearyl Alcohol, Mel (Honey), Glycerin, Theobroma Cacao (Cocoa) Seed Butter, Candelilla/Jojoba/Rice Bran Polyglyceryl-3 Esters, Glyceryl Stearate, Sodium Stearoyl Lactylate, Sodium Polyacrylate, Cyclopentasiloxane, Glyceryl Stearate SE, Ribes Nigrum (Blackcurrant) Seed Oil, Parfum (Fragrance), Polyacrylamide, Hydrogenated Polydecene, Polysilicone 11, Sodium Stearoyl Glutamate, Benzyl Alcohol, C13-14 Isoparaffin, Dimethicone, Sodium Hydroxymethylglycinate, Xanthan Gum, Citric Acid, Disodium EDTA, Olea Europaea (Olive) Fruit Oil, Persea Gratissima (Avocado) Oil, Royal Jelly, Trideceth-6, Laureth-7, Propolis Extract, Rosa Canina (Rosehip) Fruit Oil, Propylene Glycol, Butylphenyl Methyl Propional, Dehydroacetic Acid, Linalool, Limonene, Alpha-Isomethyl Ionone, Bee Venom, Hydroxyisohexyl 3-Cyclohexene Carboxaldehyde, Sodium Benzoate. Serum: Aqua (Water), Propylene Glycol, Dimethicone, Mel (Honey), Cyclopentasiloxane, Polysilicone 11, Glyceryl Stearate, PEG-100 Stearate, Polyacrylamide, Caprylic/Capric Triglyceride, HDI/Trimethylol Hexyllactone Crosspolymer, Phenoxyethanol, C13-14 Isoparaffin, Cetyl Alcohol, Tapioca Starch Polymethylsilsequioxane, Parfum (Fragrance), Propolis Extract, Sodium Hydroxymethylglycinate, Xanthan Gum, Laureth-7, Sodium Hyaluronate, Disodium EDTA, Ethylhexylglycerin, Olea Europaea (Olive) Fruit Oil, Ribes Nigrum (Blackcurrant) Seed Oil, Royal Jelly, Sodium Hydroxide, Tocopherol Acetate, Rosa Canina (Rosehip) Fruit Oil, Butylphenyl Methyl Propional, Silica, Linalool, Limonene, Alpha-Isomethyl Ionone, Bee Venom, Hydroxyisohexyl 3-Cyclohexene Carboxaldehyde, Sodium Benzoate. Cleanser: Ethylhexyl Palmitate, Caprylic/Capric Triglyceride, Glycerin, Glyceryl Behenate, Polyglyceryl-3 Diisostearate, Olive Oil PEG-7 Esters, Acacia Deucurrens/Jojoba/Sunflower Seed Wax/Polyglyceryl-3 Esters, Glyceryl Stearate SE, Polysorbate 20, Cocos Nucifera (Coconut) Oil, Ribes Nigrum (Blackcurrant) Seed Oil, Phenoxyethanol, Tocopheryl Acetate, Parfum (Fragrance), Ethylhexylglycerin, Rosa Canina (Rosehip) Fruit Oil, Gardenia Tahitensis (Tiare) Flower Extract, Butylphenyl Methyl Propional, Mel (Honey), Bee Venom.